Now is a great time to take advantage of your membership with First Tech. For a limited time, Amazon employees can earn up to $1,0001. Here’s how it works. Combine a new direct deposit, a new checking account, and a new credit card to stack up cash bonuses and rewards. Simply open your accounts or enroll in the Direct Deposit Bonus at any First Tech Experience Center and provide proof of employment at Amazon. Offer expires April 30, 2019. See complete terms and conditions below. Visit your nearest First Tech Location, or call us at 855.855.8805 to take advantage of this offer. Not available online. 1Offer expires 04.30.19. Offer valid for Amazon, their subsidiary and vendor SEG employees, and their immediate family members. Immediate family members include spouse or domestic partner and children. Must be 18 years of age to participate. Individuals may participate in any or all of the bonus offers. This offer may be combined with any other ongoing offer at First Technology Federal Credit Union (“First Tech”). New accounts must be opened in branch and must be a personal account. Fiduciary, Trust, Business, Organization, or Health Savings Accounts are not eligible. Participating individuals must not be primary Tax Reporting Owner on a checking account at First Tech currently or within the last six months to qualify. For new and existing members, opening a Membership Savings Account and an initial deposit of $5.00 is required prior to opening any other type of account. Any qualifying bonus will be deposited to your Membership Savings account week following 120 days from enrollment. Account must be in good standing (not in default, closed, inactive, or otherwise not in good standing). Dividends are considered interest and may be reported on IRS form 1099 INT. 2New direct deposit must occur at least once a month from the participant’s employer payroll, retirement/pension distribution, or Social Security Administration. Any ACH which is not a payroll direct deposit does not qualify. Initial, new direct deposit must take place within 60 days of enrollment date. New or existing recurring monthly minimum direct deposit amount must increase by a total of $250 for a $100 bonus, $1,000 for a $250 bonus, and $2,000 for a $500 bonus. At least two recurring direct deposits must be completed within 90 days of enrollment. 3APY = Annual Percentage Yield. 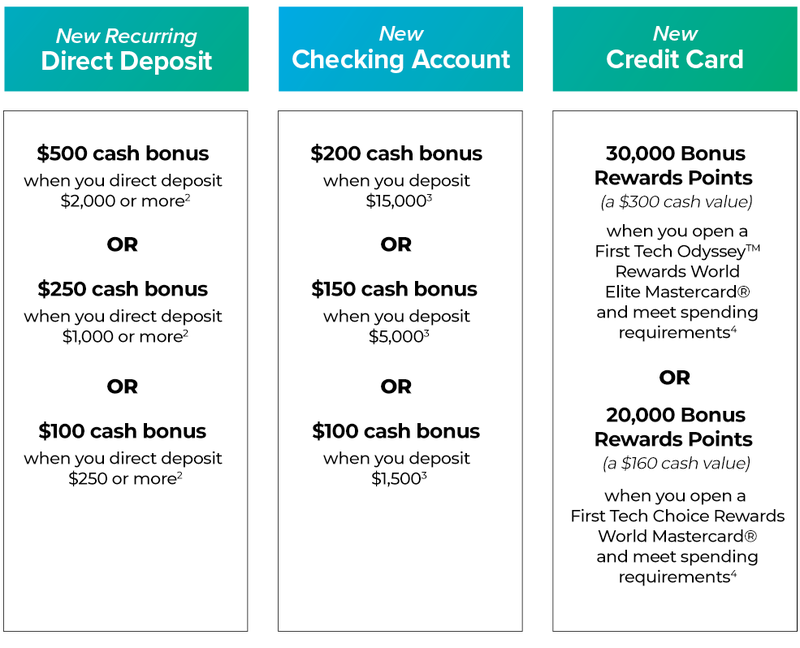 At least $1,500 must be deposited within 30 days of new account opening to qualify for $100 bonus, at least $5,000 must be deposited within 30 days of new account opening to qualify for $150 bonus, and at least $15,000 must be deposited within 30 days of account opening to receive $200 bonus. Corresponding tier minimums must remain in the qualifying checking account for 90 consecutive days after the 30 day funding period for that tier bonus. New money must be deposited from a source outside First Tech. Transfers between First Tech accounts or its affiliates will not qualify. 2.00% APY on $15,000 is $300. Rates subject to change. Terms and conditions apply. 4To qualify for the 30,000 Rewards Points bonus on a new OdysseyTM Rewards World EliteMastercard®, purchases totaling $3,000 must post to account within 90 days of account opening. 30,000 points equals $300 cash value. To qualify for the 20,000 Rewards Points bonus on a new Choice Rewards World Mastercard®, purchases totaling $3,000 must post to account within 60 days of account opening. 20,000 points equals $160 cash value. Rewards Points will be awarded on the second statement following qualification for the bonus. Returned purchases, balance transfers, finance charges, fees, cash advances, purchases of cash or cash equivalents (prepaid debit cards or other stored value/reloadable cards), interest charges, gambling chips, lottery tickets, travelers’ checks, insurance charges, or unauthorized charges are not eligible for Rewards Points. First Tech does not have the ability to control how a retailer chooses to classify their business and therefore reserves the right to determine which purchases qualify for Rewards Points. A $75 annual fee applies to the OdysseyTM Rewards World Elite Mastercard® and is waived for the first year. Offer is subject to credit qualifications. Rates subject to change. Terms, conditions, and some restrictions may apply.